Old wives' tales? The United States Department of Agriculture states "Food stored constantly at 0°F will always be safe. Only the quality suffers with lengthy freezer storage. Freezing keeps food safe by slowing the movement of molecules, causing microbes to enter a dormant stage." Are you going to trust a chef on TV or an engineer who is obsessed with reading about cooking (or the government)? :) Hmmm, come to think of it, none of those are comforting sources of information. If you're concerned, then eat your frozen meats within six months - chances are the quality will be better anyway. I'm really surprised that the meat was able to dehydrate that quickly in just one night. Often, a color change in the meat is mistaken for freezer burn, but the color change does not affect texture or taste. Make sure the meat is burned but feeling it's surface texture after it has been thawed (in the refrigerator). If it's dry and coarse, then it is indeed freezer burn. If it's feels like the reast of the steak, then cook yourself a steak! For jerky - I've never made jerky from freezer burned meat, but it seems like it could be worth a try. If the meat's been properly handled, there should be no safety issues with working with a freezer burned steak. I'm not sure if the burned area will take on the flavors of the marinade effectively, but it sounds like it'll be worth a try. It has discolouration, large cracks, and appears dry in its still frozen state. To say it was overnight was a bit of a hyperbole - it was most of the day and one night with no covering whatsoever. But it did get me thinking about my freezer-burn jerky theory. I'm looking for a thawing machine in the market but couldn't find one. Thawing meat in the microwave is the worst method I know because some part of the meat might get cooked and the rest are still frozen. My husband is an electrical engineer and he doesn't cook at all. Unfortunately, it is my fault since I spoil him by taking care of all the meals. I am going to send him your site and see if he can learn a thing or two and maybe suprise me with a meal. When you thaw meat in the refrigerator, no part of the meat even reaches a temperature above 40�F, the low point of the temperature range where bacteria and microbial reproduction occurs at an appreciable level. This means, freshly thawed meat will have similar levels of microorganisms as the frozen meat - refreezing will result in roughly the same concentration of microbes. 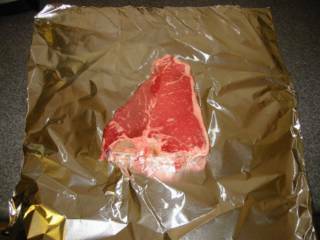 When meat is thawed in another manner, parts of the meat will have reached a temperature above 40�F while other parts are still thawing. By the time the interior has fully thawed, the warmer portions have been conducive to microbial reproduction for quite some time. To refreeze the meat at this point will result in a larger culture of bacteria and microbes being frozen with the meat. When it is thawed again, the bacterial colonies have had a jump start and may reach concentrations high enough to cause us problems if not completely killed. Unfortunately, that usually requires us to hold the meat at a high temperature rendering it unpalatable (imagine cooking a steak to 170�F and holding it there for ten to fifteen minutes - that's going to be one tough piece of meat) to avoid food poisoning. If not careful, unwelcome visits to the bathroom may occur or even in some cases the body will forcibly reject the food. In the elderly or those with weak immune systems, extreme illness or even death may occur from the food poisoning. Maybe not as important as the potential health issues when re-freezing thawed foods, there is also a food quality issue. Ice crystals form when food freezes (when anything freezes for that matter). These crystals rupture cells. Repeating the freezing cycle damages more cells, which causes loss of moisture and texture. Also, much earlier in this thread, someone stated that rapid freezing causes more cell damage than slow freezing. IIRC, Alton Brown demonstrated the opposite in the "Strawwberry Skies" episode of "Good Eats" - the strawberries he froze using dry ice oozed less juice than those frozen conventionally. His explanation was that rapid freezing results in the formation of smaller ice crystals than a slow freeze. Great website, BTW. I just found this site yesterday and I've already read almost everything here. I just returned from the hospital where I was treated for anaphyletic shock and poisoning (simultaneously!) due to scombroid poisoning of fresh salmon. Neither freezing nor cooking kills this bacterial toxin. One can't see, smell or taste it. I think it is found mostly in warm water fish but more and more it is found in cold water fish like salmon. I think that this might be due to the environmentally friendly new "long-line" fishing (where fishing lines are miles long and it takes days to reel in the fish.) With ocean temperatures up a few degrees, there may be more of an opportunity for bad pathogens to develop? Even though it took a 911 call to save my life, I'm not going to stop eating fresh salmon. It's quite rare. I just thought I'd mention it here so people might be reminded to double check the source of their fresh fish. Wonderful site, by the way. I just stumbled on y'all! I have come up with a good solution to the thawing/germs issue. I buy my chicken breast by the family pack, although it is only my husband and me. I cook all of it the first day; than I cut up some, shred some, some of it stays whole. THEN I freeze it. IT is so easy to pull out a bag of precooked chicken breast, throw it in the fridge then when we come home -- it's ready to go! had a frozen 10-12lb turkey given to me at the office and i did not know about it at that time. it was left on the coffee room table by accident over night in a shopping bag. came into work next morning and turkey was somewhat soft with water on the table. i was told to cook it right away, others said ok to freeze it. i really did not want to cook it, so i re-froze it. Question: when i thaw this and cook it sometime during xmas, will 4-5 hrs in oven or rottiserie make it ok for me to serve without guests fighting for the bathroom? I think it is okay to assume that cooking the turkey in an oven for 4-5 hours is going to kill all the bad bacteria that we're so concerned about. Unfortunately, it may not be enough to destroy any toxins that a large culture of bacteria may have been producing prior to refreezing. Many toxins won't break down until your turkey has reached a temperture that will make the fowl foul to taste. Whether or not the bacteria has enough time to grow a sizable culture and produce a reasonable quantity of toxins, is a risk that you'll have to decide for yourself if you want to take. 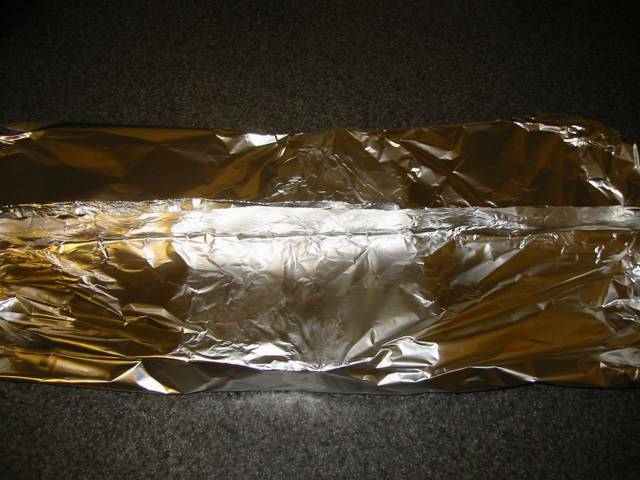 To my surprise, many of you are concerned about freezing and thawing, but no one comments on the aluminum foil used to cover the meat in Michael�s "recipe". I thought it is common knowledge that even traces of salt and water on aluminum produce toxins without any help of bacteria. Nitrates are known to support the growth of cancer, and aluminum is found in the brains of patients suffering from Alzheimer�s disease (whether that is caused by using dishes with that metal or just a coincidence has not been thoroughly looked at, as far as I know). Last night ~2 am I put some still sealed tuna steak in a metal mixing bowl of water and placed that in the fridge. I normally just do it in the fridge for like 2 days. It is done right now ~10 am. There are several factors that contribute in the growth of the bateria. Take note, bacteria is not the sole contributor to food poisoning but the toxins they produce, y'know in comes one way out goes the other. These are what contrubute to bacteria growth. Take away one of these factors and you don't have to run to the john two hours later. 1. Temperature - these creatures multiply roughly every 30 minutes between 41 and 140 degree fahrenheit. And millions of them reside in pinhead sized playground. So if you're defrosting food in the sink for hours at a time, you will kill the bacteria after cooking in the correct temperature but the toxins remain. 2.Oxigen - Now, that is diffcult to control. It's everywhere. So we resort to controlling other factors. 3.Acidity - The guy who marinade his meat, given that he used ingredients such as vinegar or other acidic agents will still be able to come home at night and eat his meat after hours of brewing and not be sick. 4.Moisture - That is why beef jerky is safe. I think I got all of them. Just be sensible about defrosting you meats. Slow defrost bringing it down to the refrigerator for a day or two is the best method. Another tip: Once you start cooking you cannot stop. So defrosting in the microwave is technically cooking so no refreezing. If you're in a bit of a hurry, place the meat in a container where it could "submerge" and have running cold water. My wife made some chicken lastnight around 12am, I was in charge of putting it away after it had cooled down. But with my lazy eyes I became tired...and in the morning to her surprise I had left the chicken out all night! at least for 7 hours. Does anyone know if bacteria has formed over night. WOULD IT BE SFE EATING? Even cooked meat will have bacteria that will grow if given the proper environment. While cooking kills a significant portion of the bacteria, if you were to cook the meat until it was steril, you would not want to eat the meat. So eating cooked meat that has been left out is not the best idea, but it is up to you to risk it (especially if you reheat it sufficently). Instead of allowing to thaw in a sink during the day, or let to thaw in the refrigerator, Alton Brown's quick thaw method works within an hour or two. Submerge the ziplock bag in water, weigh it down with something (I have a piece of towing chain from the hardware store that works wonderfully) and place in the sink. Turn the faucet on "dribble." It's wasteful of water, but thaws things quickly, and keeps things fairly cool, avoiding nasty bacterial growths that can really ruin your BBQ. Jerky is safe to store at room temperature because there is so little water in it that bacteria cannot grow in that medium. As one poster said, thawing meat on the counter is only asking for trouble. It's true that most people won't be affected by food poisoning, but if you are serving anyone who is very young, elderly, or has a compromised immune system and they get sick, they may die. There's no point in taking such risks. And spices do not protect enough against bacteria. It's true that some do protect; salt protects because it, again, takes away the available water that bacteria need to grow. If you get large enough numbers of bacteria growing, they can and do release toxins that will not be destroyed by heat, no matter how long you cook it. I like freezing chicken breasts in Kraft Zesty Italian Dressing in a freezer bag. It seems to work similar to brining as the meat is very moist and flavourful after cooking. I got this idea from an infomercial that touted a quick way of thawing frozen steaks "in minutes". It involved buying what looked like a large, square metal skillet and placing the meat on the thing. The solid pieces of frozen meat would miraculously thaw and turn supple (i.e. room temp) in just minutes. You didn't even have to plug this into an electrical socket. Somewhere in the internet I found out that it was just basically a large metal teflon coated pan. So I wanted to test this. I took a solid, frozen steak and placed it on a large teflon skillet on my range with no heat. I was amazed to find that the meat actually thawed very quickly to refrigderator tempurature in just 15 minutes or so. It has been a while since I took physics but I think it has to do with the skillet acting like a heat (or in this case, cold) sink and dissapating the cold in a larger surface area, and drawing out the cold (or infusing the warmth) more efficiently. I have used this techique ever since without failure except when the frozen meat is shaped in a way where only a mimimal amount of it is in physical contact with the skillet thus decreasing the amount of potential temperature exchange. I honestly think this is the best way to defrost frozen meat. I HATE using the microwave. It ends up being a balancing act of frozen, cooked, and rubberized meat. "On a lighter note, the main reason to get a chest-style "deep freezer" is because you can store food safely for longer periods. That's because it won't undergo the freeze-thaw cycles which frost-free, in-fridge freezers use (as often as every six hours) to avoid frost build-up. Technology geeks can see more detail at How Stuff Works and Appliance411. " Confusing self defrosting and the style of freezer is just a mistake. Sears and various other vendors have upright freezers which are not frost free. 20ft^3 or so.I find it's a lot easier to find what I want quickly in an upright. A useful adjunct is a medical grade temp sensor with alarm. <http://www.tiptemp.com/Product.aspx?ProductID=21802> for example. More flexible than the built in temp alarm of many modern units.s. In retrospect, I should have sprung for the gycol probe to prevent false positives from short openings. :shock: I'm slight concerned over the apparent.... ignorance, is that the right word? (seems a little strong) displayed here re: the differing risks that can be faced in the handling of different meats. Of course appropriate safety and hygiene has to be practiced with all meats (and foods), but some are more dangerous than others, both because of certain biological factors, and because of how they are handled and processed before they get to you. For whatever reason, the more commonly 'hung' meats, such as beef and lamb, are typically less sensitive and dangerous when it comes to what you do with them. You can make jerky just by drying, salting and seasoning, safely eat a medium-rare steak, etc. But have you ever had a 'rare' chicken breast, or turkey jerkey? (or pork, for that matter...) --- No. These are somewhat more pathogen-ridden/sensitive meats, and require more careful handling and more thorough cooking to destroy the more numerous and/or potentially dangerous microbes that reside within. Because of this, and having learnt my lesson the painful way in the past when pushing things a little beyond their safe consumation date, I wouldn't touch much of that 'softening' turkey unless it had been immediately well-cooked, nor the chicken breasts left in the sink, regardless of marinading or spicing, unless the sink was guaranteeably out of direct sunlight (mine isn't; it faces west-southwest) and the defrosting time was fairly well-established to take about a working day. Preferably I would take it from the freezer first thing and put it in the fridge, where it would be mostly defrosted by the end of the day, with maybe a half hour max in a room temperature environment during any preparation followed by a thorough cooking which would heat all parts of it through to a safe temperature ---- with the gastronomic 'quality' of the output (subject to overcooking, overly rapid 2nd stage defrosting, freezer burn or what have you) being a distant second to the more pressing concern of it not Killing Me Dead after eating. Seriously. You don't mess with poultry. Beef & lamb keep quite well, if it's either whole or a carefully butchered slice (ground, as in mince or hamburger, is not so good - as mentioned, in these cases the bacteria is only on the 'outside' of the cut and so is a small amount easily destroyed by cooking, particularly of a 'searing' type).... non-game birds, less so. I don't know the reason why. Only that it is so, and i've paid the gastrointestinal price at least once before for going against my knowledge and instincts because I was too stingy and lazy to throw a borderline piece away and make/go buy something else for lunch. You can kill the bacteria, but you do NOT kill the toxins. You can cook it for 3 days and the toxins will still get you. >>You can kill the bacteria, but you do NOT kill the toxins. You can cook it for 3 days and the toxins will still get you. need a bit more specifics on these "toxins" - botulism is the usual culprit with regard to toxins - it's not the botulism spores that are a problem - but rather the toxins they produce when they get the right conditions to multiply. and, the botulism toxin is destroyed by less than boiling temps - so I'm baffled by the reference. since you're responding to a post from Jan of 2008, not sure of the rest. :lol: I am a chef and I agree with Mr. Chu, although we are mandated safe food practises in all levels of food, by the government. I freeze plenty of foodsl, not just meat, and my family and I just absolutely enjoy everymeal everytime when it is defrosted from the deep freeze. If you have doubts simply use your own time line, practise makes perfect. It is safe to freeze uncooked minced turkey once I've added ingredients such as onions, spice, cilantro and mint? Or is it better to fully cook the kabobs and then freeze them? I'll take our turkey out of the deep freeze about 3-4 days before roasting...keep it in the reefer.... on day of the big dinner I'll make the stuffing & bake it in a separate casserole with enough turkey tails to cover the stuffing (dressing) ....turkey fat drips down and it tastes the same as in- the- bird stuffing. Do I understand correctly that freezer burn will gradually (~ months) occur in the presence of even only a small amount of air, such as will be trapped inside a plastic freezer bag? 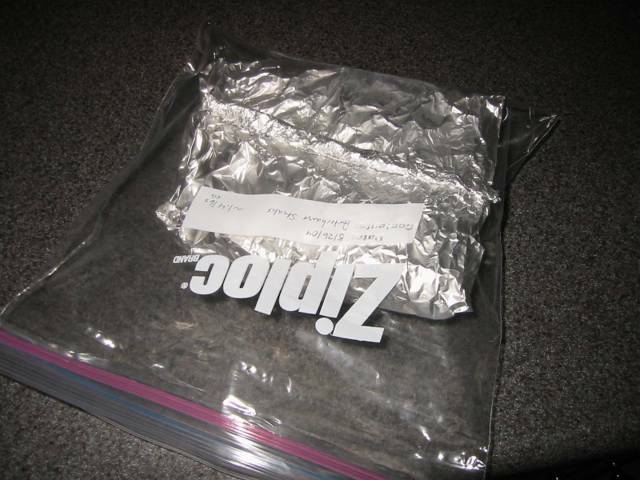 If not, the article's time-consuming step of sealing(NOTE 1) in aluminum foil before storing in a freezer bag is superfluous, but then the statement "...vacuum sealing, wrapping in heavy-duty aluminum foil, or using a plastic freezer bag." would make sense. OTOH if so, will the limited amount of air have a practical effect on the rate of "burn" or maximum amount of burn (i.e. sublimation ceasing when the trapped air reaches 100% relative humidity)? 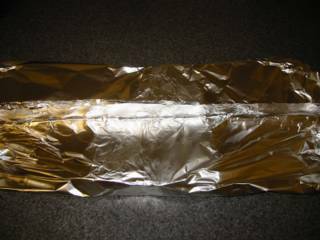 In regards to wrapping meat in foil, are there any acidic or other components that can cause a reaction to the foil like tomato based products can? I know it is not recommended to cook tomato based foods in an aluminum vessels because some of the aluminum goes into the food and thus into our bodies. Just looking to cover all bases. Like the Science Channel says, I question everything! Thanks in advance. first, as you wish to question everything, you should research the role of aluminum regards human health. the "rumor" got started in the 50's by a UK doctor. since then the danger of aluminum, especially with regard to the Alzheimer / dementia issue, has been disproved by many many authoritative health agencies. now, understand, according to the aluminum freakoos, all these "entities" are in a great conspiracy . . .
next, "freezer burn" is a not a burn but - as you point out - "dessication" of meat tissue. water in the frozen meat sublimes into the air of the freezer. one solution: a moisture barrier - that being something that water vapor aka moisture cannot penetrate. aluminum foil is a metal - it is a perfect moisture barrier. plastics are not. 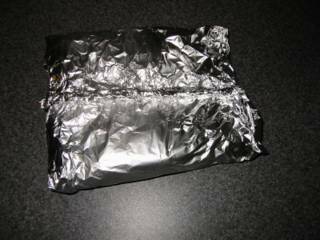 I only 'temporarily' freeze meats - wrapped in heavy duty foil - for the 2 - 4 month time frame, never an issue. Hi. I'm hoping you can help me. Is it safe to sear a roast, pork or beef, and freeze it? If it's safe, does the meat need to cool completely before I stick it in the freezer? We love to go camping and my husband wants to go in the colder months. I seriously doubt he's going to enjoy grilling when it's nasty out, so I'm thinking I'll be packing the crockpot. Thanks. ...camping crockpot - my experiences with "camping" do not include 110v convenience outlets, so you'll have to invent. There's an old technique for that but I forget its name. Basically, you fill a box with straw, add hot rocks and your dutch oven. Cover with more straw. Cover the whole box and let sit for 6-8 hours. Residual heat does the rest. I have eaten a turkey that was stored in my deep freezer at a temperature appx. much be low 0� with no ill effects and had no freezer burn. Remember that article years ago when some people are meat from a frozen mammoth. The answer I believe in keeping meat longer than usual, is to turn your deep freezer as far done as it can go to get below 0� and refrain from opening rarely unless you are planning a meal and anticipate any other foods in the freezer that you will be eating within 3 months after you have placed it in your refrigerator's freezer. When in doubt though throw item out.